Established in 1996, Flash Track Lighting is your leading designer and seller for Animated Chase Light Controllers. Choose Flash Track Lighting, the chase light experts, for high quality, cost effective, controllers. When you buy from us, not only will you get a high quality, reliable, chase light controller, but you will also get customer service from the experts should you have any questions. We design our own controller models and commission their manufacturing, so if you have any problems or questions, we know our products and we CAN help you! All of our controllers automatically come with our quality guarantee and our expert service. We are here to help you every step of the way for no additional charge - from choosing the right controller for your display, to wiring your lights for the desired effect, to helping you troubleshoot and resolve any problems that may arise. Call or email us today to experience our expert customer service for yourself and to purchase your chase light controller. *Important Note: We ONLY accept orders by phone or email so that we can ensure you are purchasing the right controller for your display's needs. * Call us at 636-391-1161 or email us at Sales@FlashTrackLighting.com to discuss your display and place your order. Christmas Light Displays, Chase Lights, Signs, Casino Displays, or any Moving Light Display, no matter the application. 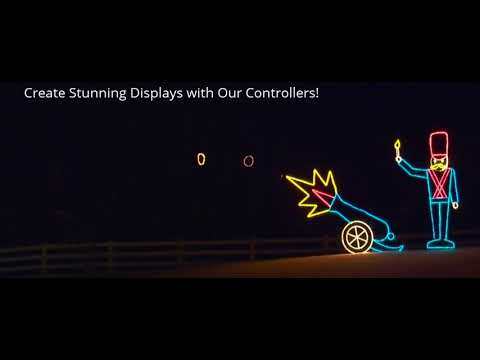 Click Here to See More Examples of What Our Chase Light Controllers Can Do! Dip Switch or Rotary Dial (depending on model) for Selecting your Desired Chase Pattern - no messing with jumpers or wires! All models produced in 2015 or later can be re-purposed to perform a 2-4 Track Chase so long as enough tracks are working. (See the “Re-Purposing Controllers” link on the instructions page for details). Check out the links below to view our different controller models, or, if you're not sure which controller is right for you, give us a call and let us help you find the perfect controller for your needs for no additional charge!